John “Johnny” Royce Mathis, singer, was born in Gilmer, Texas on September 30, 1935, the fourth of seven children born to Clem, a chauffeur and handyman, and Mildred, a maid. The Mathis family moved to San Francisco, California‘s Fillmore District when Mathis was a young child. When Clem Mathis, who had worked for a time in vaudeville, recognized his son’s musical talent, the family scraped together $25, bought a piano and began teaching him songs and routines. Soon afterwards young Mathis started performing in church and school shows. At the age of thirteen Mathis began taking lessons with Connie Cox, a San Francisco music teacher, paying for his training by working in the Cox home. Mathis studied with Cox for the next six years, receiving voice training in classical music including opera. Mathis was also a star basketball player, high jumper, and track and field athlete at George Washington High School in San Francisco. In 1954 he enrolled at San Francisco State University on an athletic scholarship with the intention of becoming an English and physical education instructor. While there he broke the University of San Francisco and later basketball great Bill Russell’s high jump record. Mathis also often took part in San Francisco’s famous Black Hawk nightclub jam sessions with a jazz sextet. In 1955 club co-owner Helen Noga noticed his singing talent at one of these sessions and began scheduling him for performances around San Francisco nightclubs. At one of these performances Mathis was offered a recording contract with Columbia Records. On his father’s advice Mathis decided to pursue a musical career rather than compete in the Olympic tryouts that year. In 1956 he recorded his first jazz album, Johnny Mathis: a New Sound in Popular Song, which failed to impress the critics. Fame, however, quickly came the following year. Columbia Records Vice President Mitch Miller then persuaded Mathis to focus on romantic jazz ballads. In late 1956 he recorded his first hit, “Wonderful! Wonderful!” which sold more than a million records. It was soon followed by “It’s Not for Me to Say.” MGM Studios signed Mathis to sing that song in the 1957 film Lizzie. Shortly afterwards 20th Century Fox contracted Mathis to sing in its film A Certain Smile. Before the year ended Mathis recorded two other hits, “Chances Are” and “The Twelfth of Never,” and appeared on The Ed Sullivan Show. The national exposure on television and in films ensured stardom for the performer critics now called “the velvet voice.” In 1958 Mathis achieved another distinction. His Johnny’s Greatest Hits album was first greatest hits album released in the music industry. It would over time become one of the bestselling albums for Columbia Records. Throughout the late 1950s and the 1960s Mathis performed on numerous variety shows including The Ed Sullivan Show and The Perry Como Show and had successful concert tours. Mathis, however, stopped recording between 1965 and 1973 and he did not have another number one single until his 1978 duet with Deniece Williams, “Too Much, Too Little, Too Late.” His teaming with Williams was the result of Mathis’s response to changing musical tastes. With the release of “I’m Coming Home” in 1973 Mathis turned to the rhythm and blues style of the 1960s to introduce a more “soulful” upbeat sound to his work. He also performed duets with Williams, Jane Olivor, and Dionne Warwick, a move that was both critically and financially successful. Mathis, an avid golfer, has hosted a charity golf tournament in Belfast, Northern Ireland since 1985. Since 1982 he has hosted the Johnny Mathis Invitational Track & Field Meet at San Francisco State College. 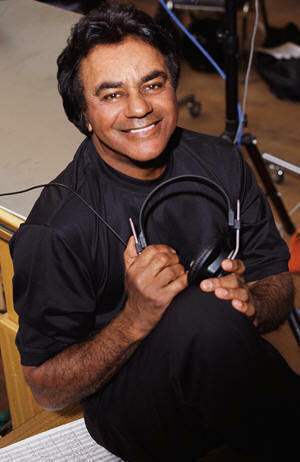 Johnny Mathis continues to be an active recording and performing artist. He has sold more than 350 million records and albums over his career. Mathis, who survived prostate cancer after surgery in 2005, lives in Hollywood Hills, California. J. Green, "Forever Johnny: What It Takes to Maintain the Mathis Lifestyle," New Yorker Magazine, July 3, 2000: 54-58.